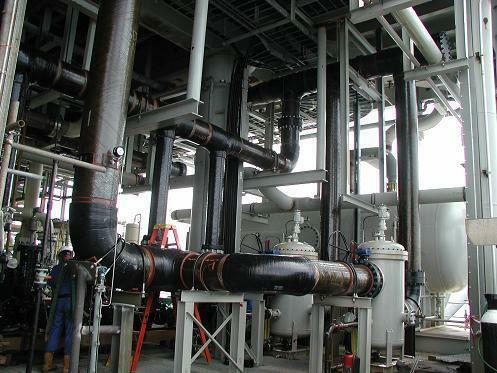 Our company holds expertise in offering High Pressure Piping to our valuable customers. The offered piping systems are commonly used in different industries for transferring of fluids or gases from one place to another in most efficient manner. These piping systems are precisely designed to work under extreme condition of pressure and temperature. Hardik Engineering Solutions Pvt. Ltd. is a company has been formed with a goal to provide Single Window Solutions right from the concept to the commissioning stage for power plants. We are suppliers and also designers of Industrial & Power Boilers, High Pressure Piping, Chimney, Silos & Bunkers and Boilers & Other Structures. Leading supplier of Industrial Manufacturing Products, Economiser Coil, Water Well & Furnace Tube, Pipes and Fittings, Industrial Duct, Damper & Bellows, Steel Chimney, Super Heater Coils. We are also a prominent Service provider of Operation & Maintenance & Erection & Commissioning. Our workforce comprises a team of good power plant professionals having vast and varied experience in various activities related to power plants viz Design, Manufacturing, Erection, Commissioning, Operation & Maintenance, Trouble Shooting, Residual Life Assessment, Retrofitting & Revamping, Capacity Enhancement, Relocation, Energy Audit etc. The plant related products manufactured by us are well-known for their sturdiness and durability. At HARDIK we have a pool of Super Specialists from the field of Design, Engineering, Manufacturing, Erection & Commissioning, Operation & Maintenance, Repairs and Troubleshooting of Power Plant and its equipment of any make & capacity. We have been able to create a niche for ourselves in the field of small & medium size Thermal Power Sector in India, in a short span, due to the quality of services we offer to our customer-which remains unmatched in sector. We along with our associates are offering services like EPC of power plants, refurbishment, engineering consultancy, renovation and modernization of major equipment, retrofitting, re-engineering and major overhauls. Provide specialized services on governing solutions, control philosophy, condition monitoring, heat balance, feasibility study for wind mill, soil testing, sand blasting and jet cleaning, selection of location and optimum fuel for gas and biomass plants, erection etc.. We also take up plants for their day to day operation and maintenance. Our manufacturing unit is equipped with the latest machinery that is specially designed to produce maximum output using minimum inputs and within the shortest time. Total quality management is implemented round the clock. All our machines are tested from time-to-time for their quality to ensure a hassle-free production process. Our workforce is divided into specialized units which are manned by industry experts. They have expertise in their respective areas of operation. We specialize in erecting plants within the stipulated time-frame as per the client’s specifications. Our maintenance services are provided within the stipulated time-frame by professional service providers who have the backing of years of experience. We endeavour to not just meet, but exceed the expectations of our clients by providing superior quality products and service at economical prices. Under the leadership of Mr. Harkesh Rajput, our firm has managed to set a benchmark in the manufacturing market. His quality-oriented approach, networking skills as well as his expertise have proven instrumental in driving our employees to be better than the best. His stress on following ethical business practices has helped us garner a loyal client base.